Within Teamwork Desk, you can set up a custom domain for your team to access your Teamwork Desk site. 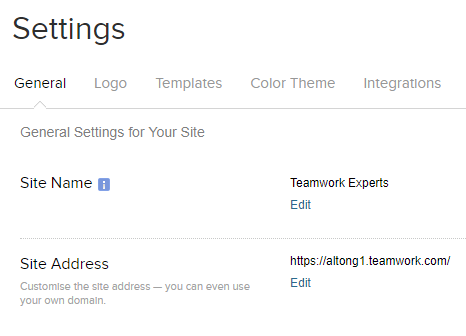 Note: The custom domain in which you choose to use will also change for your Teamwork Projects site URL. The difference between accessing your Teamwork projects and Teamwork Desk site would be by adding /desk to the end of your custom domain. For example, if your custom domain was 'test.yourcompany.com'. This test.yourcompany.com would become your root domain i.e. change from your original Teamwork Projects site and when accessing Teamwork Desk you would use test.yourcompany.com/desk. The process to set this up involves adding records in your DNS settings, so the person who manages your website would usually be able to do this for you. First, create a CName record and point it to your current site address (for example yourcompany.teamwork.com). You usually do this in a control panel from the company you registered your domain name with, such as GoDaddy.com. Next, verify the CName record is working by visiting the URL for your new custom domain in a browser. Finally, log in to your Teamwork Desk site at your current address. Click on your profile icon to the top right of the Desk navigation bar and choose Settings from the dropdown. Once in Settings, select the Company section, to the top of the page you will see Site Name. Select Go there now under site address to be brought your general Projects settings page where you can change the address from there. Select Edit next to site address, click custom domain and enter in your customer domain URL. 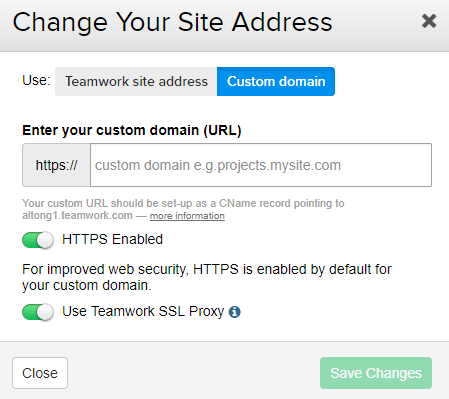 Now when you visit your custom domain URL in a browser, you'll go to your Teamwork Desk site by adding /desk to the end of your custom domain. Note: Do not use a DNS A record for your custom domain, make sure the DNS record you create is a CName record. The Internet RFC states you cannot set a CName record for a root domain so we recommend using a subdomain.